The audiobook for Pendragon was very well received. You can expect the Dark Age audiobook on December 6. If you’re looking for signed copies of the just-released paperback edition of Pendragon, there’s a huge pile waiting at Forbidden Planet in London. 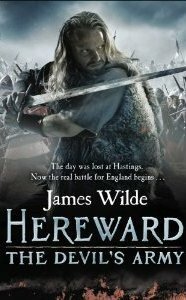 Hereward, the first book in the series, is currently on sale on Amazon for Kindle – a mere 99p. If you ever thought of sampling my work or delving into the life of England’s Greatest Hero (TM), now’s the time. Here’s the link. Hereward is published in Germany next year, courtesy of Bastel Lubbe. Here’s the cover. You can pre-order the book here.